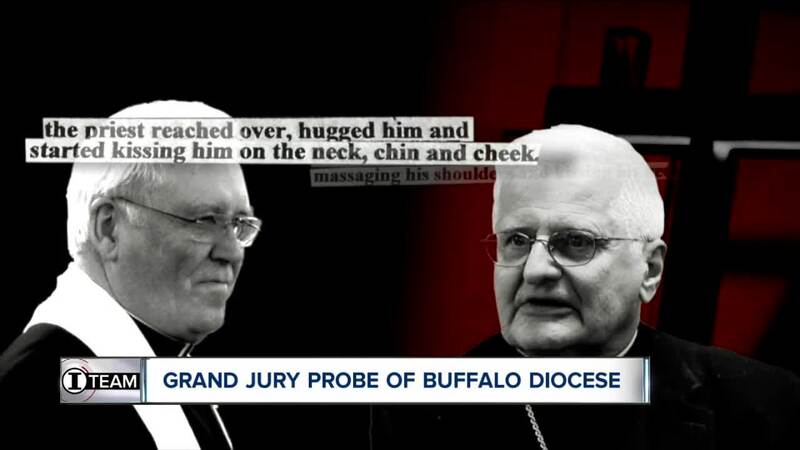 BUFFALO, N.Y. (WKBW) — A federal grand jury has been seated to investigate sexual abuse cover-up in the Catholic Church -- and Buffalo appears to be the epicenter of the investigation. That's according to Barry N. Covert and another attorney who spoke with 7 Eyewitness News about the third round of subpoenas issued to Bishop Richard J. Malone and the Diocese of Buffalo. The Buffalo News first reported the subpoenas were issued last month, but Covert -- an attorney who said federal authorities have requested files related to his client -- said the subpoenas are different than the first two rounds issued by federal investigators because they are the first confirmation of a federal grand jury investigating clergy abuse cover-up in Western New York. "It’s very significant because that means they have taken this investigation to the next level," said Covert. "Now we know that there is a federal grand jury that is specifically tasked with looking at these claims, these allegations." A grand jury would likely be hearing testimony from other cases, not just those involving the Buffalo Diocese. But on clergy abuse, Covert and others suspect federal prosecutors are looking to use a federal law that devastated the Mafia -- the Racketeer Influenced and Corrupt Organization Act -- to investigate systemic cover-up in Buffalo and other dioceses. "We think that they could be looking at RICO," Covert said. "The obstruction of justice, which is a predicate act. Moving priests around. Did they destroy any records? Did they withhold any records? Were there any incorrect, untruthful communications to law enforcement? And fraud is also a predicate act." When it comes to fraud, the latest round of subpoenas may be aimed at shaking loose documents related to the diocese's clergy abuse settlement program. Announced by Bishop Malone in March 2018 with great fanfare, the program --was criticized from the start as inadequately staffed and slow to respond to victims of clergy sexual abuse who contacted the diocese. Former state Surrogate’s Court Judge Barbara Howe and former Appellate Division Justice Jerome C. Gorski were appointed by the bishop to serve as judges for the program, and The News reported. Howe's law firm of Woods Oviatt Gilman LLP was served in March with a subpoena. Howe left the 7 Eyewitness News I-Team a message saying she and Gorski declined to comment. While many of the priest sexual abuse cases in the Diocese of Buffalo are too old to be prosecuted criminally, a racketeering investigation could focus more on a wider conspiracy involving church higher-ups, their lawyers and others involved in concealing the abuse. "It looks like in Pennsylvania and in Buffalo -- the U.S. Attorney’s office -- that they are looking at a more vast investigation that involves the diocese as well, and the administration within the diocese," Covert said. Spokeswomen for the FBI and the U.S. Attorney's office declined to comment. 7 Eyewitness News in August obtained internal emails showing the thought of a criminal investigation was "scary" to Malone , though he publicly pledged full cooperation with law enforcement. A diocesan spokeswoman did not respond to a request for comment. "It’s nerve-wracking to be the subject of a federal investigation," Covert said. "It can be suffocating." UPDATE: Diocesan spokeswoman Kathy Spangler said in a statement, "The diocese has not received any confirmation from law enforcement authorities as to the scope of any investigation. Nor have the authorities announced any details of the investigation so the diocese will not participate in the speculation. We will continue to cooperate with the requests for information as we receive them."